I grew up thinking I hated mayo, and then one day in my early teens, my uncle Eric made sandwiches with homemade mayo that blew my mind. Buttery and delicious, full of healthy fat (without which your body cannot make use of fat-soluble vitamins), homemade mayo is not just for sandwiches. It can be used to make homemade ranch, it’s the absolute best when just hinted at in a fresh broccoli salad with nuts, red wine vinegar, and garlic… really, the possibilities are endless. I graduated from Julia Child’s hallmark mayonnaise method to this recipe when I got an immersion blender and realized I could make it in ten seconds. Adding in a bit of whey at the end and letting it sit out for a few hours before refrigeration makes this already nutritious treat… gasp… a tasty probiotic supplement that will keep for weeks! So do that, too, if you decide to make it. While raw egg yolks are not something my family and I balk at – our chickens are clean and healthy and happy and lay eggs that correspond – raw egg whites, as Da’Nelle says in her mayonnaise recipe post, contain high levels of avidin. Avidin is a protein that, as your body ingests it, binds to biotin and creates biotin deficiency. Biotin is an important B-complex vitamin that helps keep blood sugar balanced by keeping the proper balance of insulin in there. It also helps build healthy fats (or moisturizers) in our largest organ, the skin. Many studies have shown, according to this article in the American Journal of Clinical Nutrition and others, that when our bodies are deficient in biotin, our production of insulin is impaired and there’s a higher instance of skin rash and irritation. The bottom line is that raw egg whites are not something to be consumed often. I do hate those beauties to go to waste, though, and I’m not a fan of the scrambled egg white or the egg white omelet. Too “eggy” for me, for some reason. Meringue! Meringue is the answer! Hot honey + whipped egg whites = simple and perfectly sweet, lily-white fluff that is brilliant on top of some coconut flour carrot raisin muffins or your favorite lemon pie, or baked into individual dollops, or eaten by the spoonful to satisfy your sweet tooth. The heat of the honey tempers the egg whites, cooking them without scrambling. Pour the honey into a saucepan and turn on the stove to just over medium. 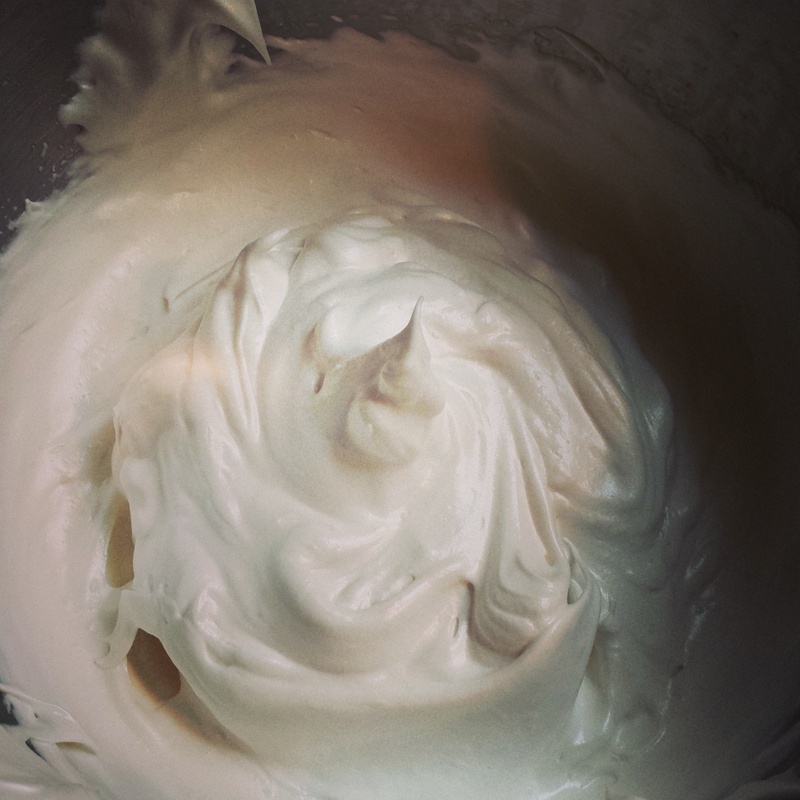 While the honey is heating, beat the egg whites with a mixer (I use a stand mixer) on medium. Keep a close eye on the honey. When it begins to bubble and froth, immediately take the saucepan, turn the mixer on high, and pour a small, steady stream of honey into the egg whites. The mixture will expand and go through some life changes, but in a couple of minutes you will have glossy, pearly meringue. Continue mixing for a couple of minutes more, until the meringue is room temperature. You’re done! Do what you’d like with it. 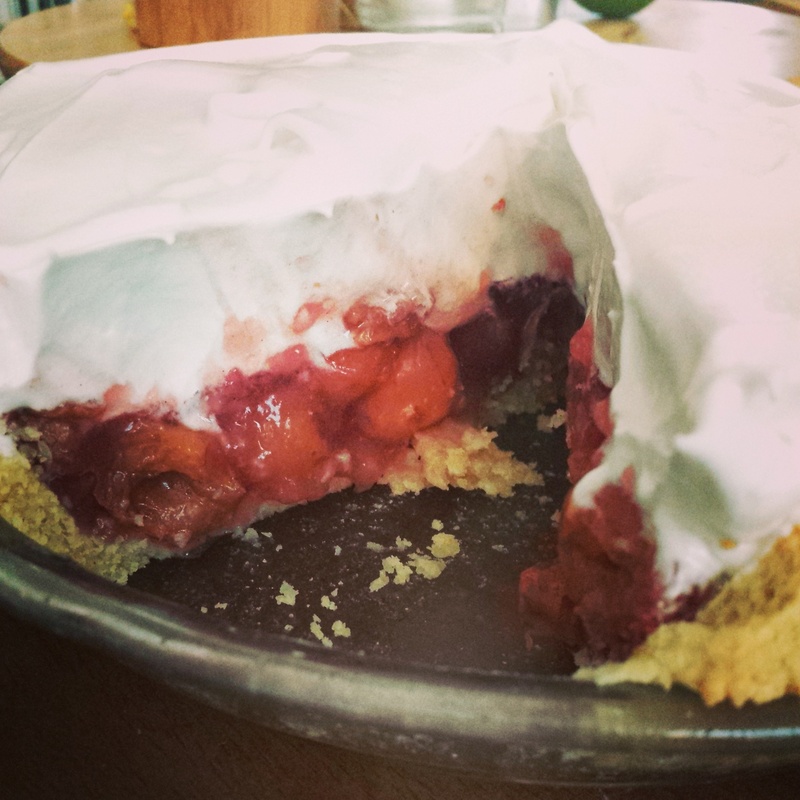 I put mine on top of some summer-frozen pie cherries in an almond flour crust, and as expected, it did not disappoint. Special thanks go to Henrietta, Tramp, Gerri the Giraffe, Alfie, Monty, and Rabbit (the chickens), for earning their keep in yet another way! 09 Jan	This entry was published on January 9, 2015 at 3:22 pm. It’s filed under Collection and tagged backyard chickens, homemade, honey, honey sweetened, mayo, mayonnaise, meringue, raw honey. Bookmark the permalink. Follow any comments here with the RSS feed for this post. I want that coconut flour carrot raisin muffin recipe! Can you email or FB it to me?